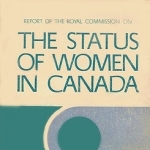 On December 7, 1970, the Royal Commission on the Status of Women released their groundbreaking report on the condition of women's lives in Canada. 47 years later, Policy4Women explores what has improved in terms of gender equality and where Canada still has room to grow. In honour of International Day of the Girl Child, Policy 4 Women has released a new resource about how we can improve funding for organizations that support women, girls, and their communities across Canada! A follow-up to "Early Childhood Education & Care (ECEC)", "The ECEC Workforce" digs deeper into an industry dominated by women workers and lacking in forward-looking policies. New resources available from Policy 4 Women! Policy 4 Women has released their first policy briefing note: "Early Childhood Education and Care". A must-read for policymakers, women’s organizations, parents, and ECEC workers! CRIAW's AGM is coming up! CRIAW's Annual General Meeting 2017 is taking place on September 28 at 7:00pm EDT! Marie-Laurence Beaumier is this year's recipient of Marta D fund! We are hosting two sessions where we will be sharing key findings from our Changing Public Services project. We are also co-sponsoring three interdisciplinary feminist sessions. Congress 2017 is taking place at Ryerson University, May 27- June 2. While yesterday’s announcement is an important first step in making better public policy, it must be matched with funding commitments that advance women’s equality. It is also critically important that diverse women – including women with disabilities, racialized women, and younger and older women – are uniquely considered. 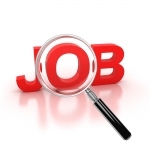 JOB OPPORTUNITY!! Deadline to apply extended till March 9! The Marta Danylewycz Memorial Fund was established with the primary objective of continuing, promoting, and supporting work in women's and gender history from a feminist perspective. More specifically, the Fund supports historical research at the doctoral level in the following areas: women and ethnicity, women and religion, women and work, women and social reform, women and education, women and family. The Fund is administered by the Canadian Research Institute for the Advancement of Women-Institut canadien de recherches sur les femmes (CRIAW-ICREF), Ottawa, Canada. 40 FEMINIST FEASTS: Challenging you to support CRIAW-ICREF! Let's keep the momentum of the women's march going! CRIAW-ICREF is celebrating its 40th anniversary as a Canadian, national, feminist research institute that cares about women and intersecting issues of equality. If you believe in the goals of the women's march then chances are you support the goals of CRIAW. In order to keep doing our work we need members and funding and here's how you can help out. The Canadian Research Institute for the Advancement of Women (CRIAW-ICREF) supports the Standing Rock Sioux and the many water protectors from across Turtle Island who have gathered at Standing Rock to stop the Dakota Access Pipeline. Our Changing Public Services Project has released a report!! Winners of the 2016 Barbara Roberts Memorial Fund! 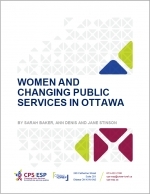 Changing Public Services project releases its first report!